I am caught in a nostalgic mood these weeks, and all this great Heavy Metal sounding like the real deal from way back, really make my days! 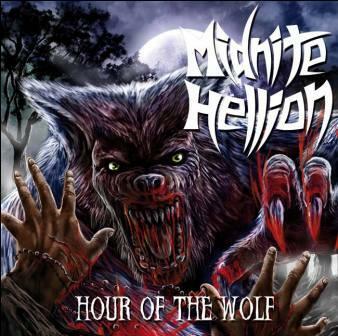 MIDNITE HELLION is one of those bands! Fierce Heavy- Speed Metal with an aggressive crossover edge, it rocks! Check the band out here on Reverbnation! New Jersey’s MIDNITE HELLION is proud to announce the release “Bitchin’ At Champs! 11-15-2013” on Contaminated Tones as part of the label’s official live bootleg series, exclusively on cassette. With a layout done in old school cut-and-paste DIY fashion, the six-track cassette captures MIDNITE HELLION blazing away on stage. “Bitchin’ At Champs! 11-15-2013” will be officially released on March 4. For ordering info, visit www.contaminatedtones.blogspot.com. The band’s recently released 7″, limited edition vinyl single, “Hour Of The Wolf” is also available on Witches Brew Records. The 7″ and more can be ordered directly from the band at www.midnitehellion.com. MIDNITE HELLION is currently hard at work on material for a new full-length album and will hit the studio next month to begin recording for a summer 2014 release date. The band has been confirmed for the 2014 Ragnarökkr Metal Apocalypse, set for April 4 & 5 at Reggie’s in Chicago, Ill. For fest details, visit www.ragnarokkrmetal.com.